Kootan in Palakkad lingua means Kuzhambu, something that’s like gravy and can be mixed with rice. As I have mentioned in one of my previous posts, I mostly like North Indian cuisine and so I never learnt to cook any of our day to day dishes which mom used to make on a regular basis. Then, once marriage got fixed, and I came to know that hubby dear is a diehard fan of our regular homemade food and does not prefer other cuisines, I had to equip myself with the bare minimum, i.e molagootal, Sambar and Rasam. 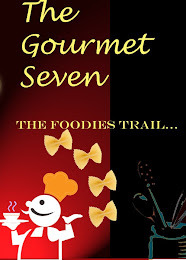 I have a diary in which I sat and noted all the Palakkad recipes. Though I don’t use that diary very often these days, but it has helped many of my other newly married cousins and also hubby dear, when I am not around. H is really fond of these yogurt based Kootans, like Mor Kuzhambu, Rasakalan, and this Mangai Kootan. Actually, mangai kootan is everyone’s favorite in our house and once the mango season starts, its mango dishes all the way till the end of the season. Wash, peel and cut the mango into medium sized pieces. In a vessel, cook the mango pieces, along with the ashgourd and drumstick pieces with salt, turmeric powder and enough water. Once the mangoes are half done, add the jaggery. And stir well. Let it boil till the mangoes and vegetables are fully cooked. 1. If mangoes are not sour, you will have to use sour curds else a day old curd will do. 2. Adjust quantity of jaggery according to sourness of the mango. Add more if required. 4. If you want to reduce the quantity of coconut, add a tsp of raw rice while grinding the paste. 5. Make sure the methi seeds are fried will but not burnt, else the kootan will turn bitter. 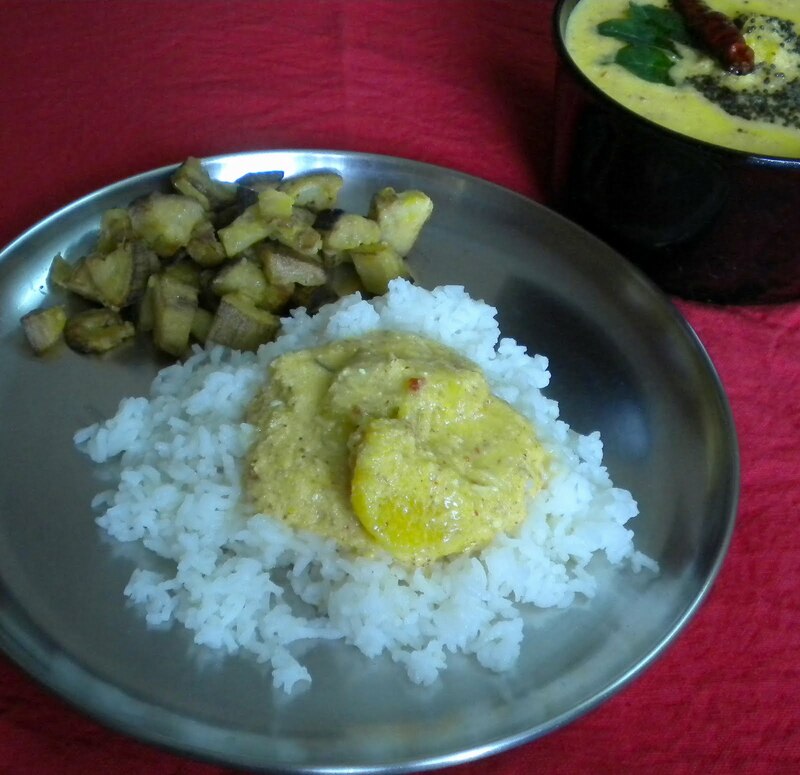 Tasty maanga kootan,I too prepare the same way, in fact last week I prepared with maampazham, it was awesome. 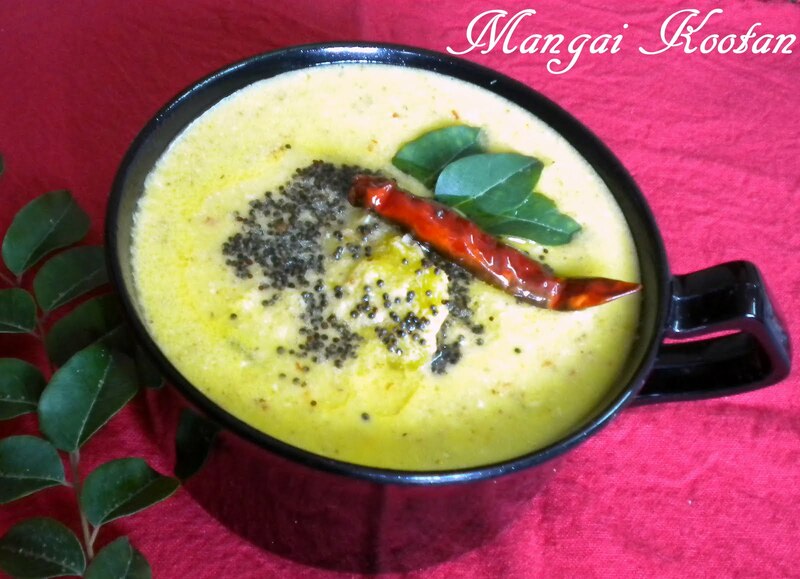 mangai kootan is my hubby's fav too- this creamy dish is a winner ! 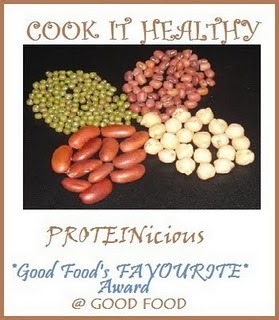 lovely recipe, havent tried this, adding methi seeds is new to me, nice mango recipe..
That platter in the last pic is so tempting ~ nice recipe! The kootan looks lip smacking good!!! 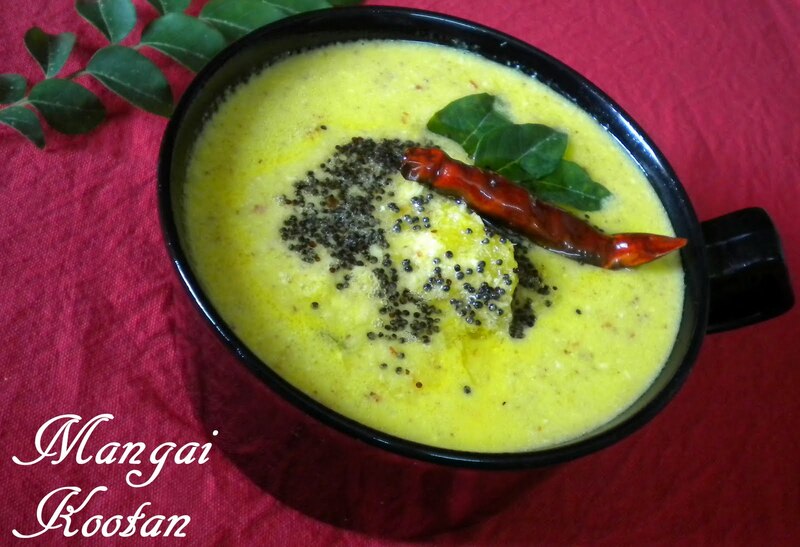 Omg, wonderful looking incredible mangai kootan,makes me hungry.. I am literally drooling here,seeing your yummy mangai kootan.Thank you dear for sending this over to Kerala Kitchen. Love the mango kootan, I miss mangai here. Wonderful looking mango kootan..looks delicious! mangakootan is very good to eat with palakkadan pappadam. you know you can add elavan,vellarikai and even chakka kottai to it. it will be very goodl.